We always look forward to the end of October ... the month that celebrates creatures, costumes & characters.This prompt is to create a card that features a *creature*. Your creature might be an animal ... a mouse ... a bird ... a robot ... elves ... snow-persons ... or yes, even a monstah ... just have fun with it ... you can see we did. Stephanie says, "When I found out Stampin' Up had a new set called Fun With Christmas that featured a Christmas Sloth ... I had to have it. As I was trying to figure out how to feature the tiny stamp, my dear husband said, "couldn't you make him into a banner" (yes, after years of providing card critique, he's that good) ... and so I did. I stamped three Christmas Sloths, colored them with pencils, and added a Ho Ho Ho ... and then finished with some washi tape. 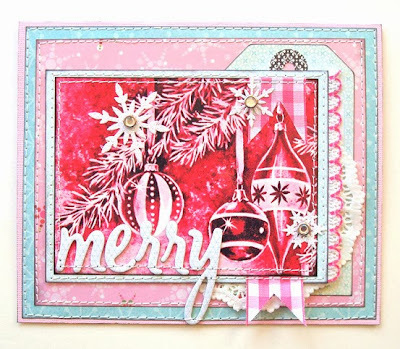 I also made a tag with a Christmas Fox from the same set if you want to click on over to my blog. And now we cannot wait to see what you will do with this fun prompt! Link your cards here by Wednesday, November 6th, at 6pm (EST). Keyword for galleries and our Flickr group is JB:13:22. 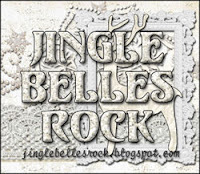 We always appreciate your efforts, ♥JINGLE BELLES♥, but this time you've outdone yourselves! Not only were your pink card creations magnificent, but when we added in multiples, there were a total of ♥81♥ cards submitted which means you helped us to raise $324.00 to benefit Susan G. Komen for the Cure!!! Take a bow, every one of you, and please accept our heartfelt thanks! 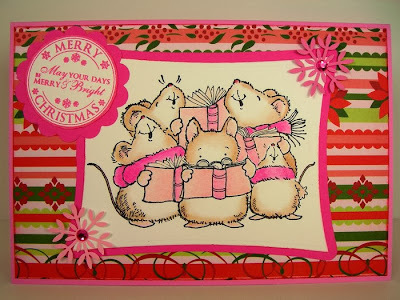 ...paired super-cute mice with super-bright colors to create a card whose praises we cannot sing loudly enough! ...used hot pink as an accent color, along with lime green, black, and beige, in a combination that is both striking and delightful! ...added just a few accents (and one very handsome deer!) 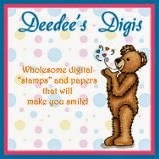 to some lovely patterned paper, for a card that's simply perfect! We *swear* that this was the genuinely RANDOM pick as chosen by Random. org!!! Though secretly we were planning to thank Marie for her enthusiasm, the *10* gorgeous cards she made for this prompt, and the way she spent this fortnight cheering on her fellow participants, all of which was VERY much appreciated!!! and thank you very much indeed! Come on back at midnight when we'll have a brand new prompt we hope will help you scare up some inspiration! We love all the prompts in the cardmaking year equally, Jingle Belles, but we think you'll understand if we confess that ♥PINK CHRISTMAS♥ has a special place in our hearts. Remember that for every new holiday card, featuring the color pink, which gets linked at the original post, Stephanie and Lauren are each donating $2 to the Susan G. Komen Foundation, for a total of $4 per card. There are NO LIMITS to how many times you can link up, so join in as often as you like! We do also have a little surprise packet of goodies to give away to a random card-maker, but mostly, what we want to do this week, is raise as much money as possible for this awesome cause! Lauren says, "Over the summer, I remember seeing a page in one of my vintage Christmas Ideals magazines that was entirely in shades of pink, and I thought to myself, "Aha! I shall save that for Pink Christmas!" I must've put it in a very safe place, because despite a vigorous search, I just can not find it! Eventually, I settled upon the pretty ornaments you see here, which were very lovely, but in their original state they were GREEN and quite over-sized! Luckily a little Photoshop magic made them the right color, the right size, and all-round just right for this prompt. 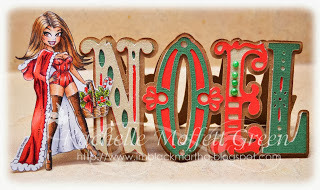 I used the current Retro Sketch for my layout, et voila!" 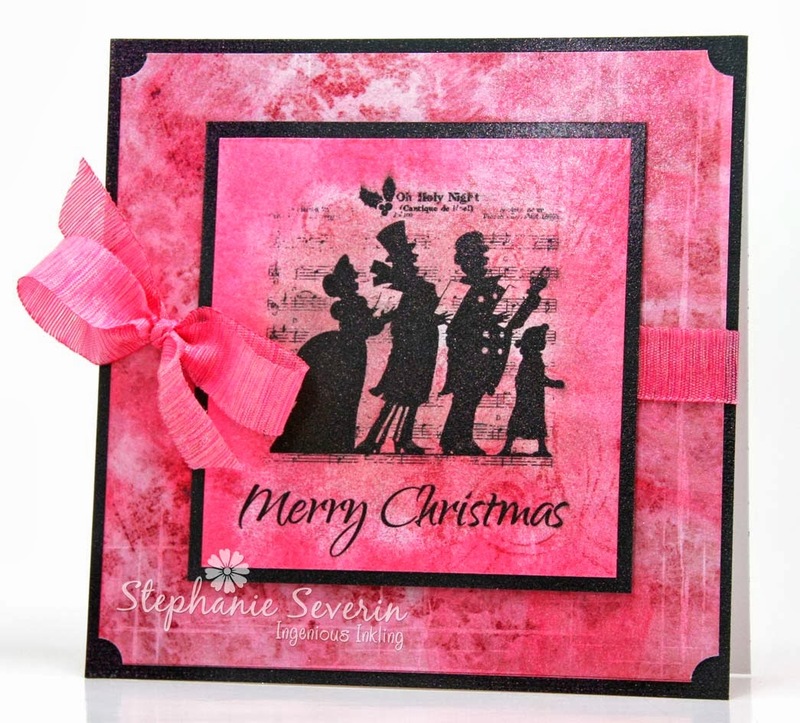 Stephanie says, "This week I went with a new-to-me line of papers from The Paper Studio called Santa & Friends that contains all sorts of fun pink hues ... who knew one of Santa's besties was a Winter Owl. 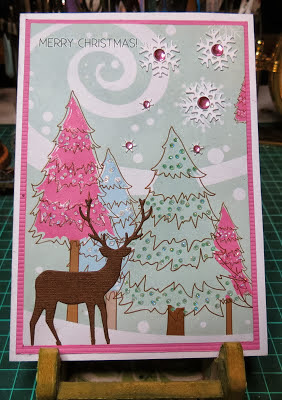 I paper pieced my Lawn Fawn Winter Owl using the fun pink snowflake paper for his scarf and orange glitter pen for his beak ... and added a few strips of washi tape to finish the design." We're super-excited to celebrate our Third Annual Pink Christmas ... for the Cure! This is the fortnight in which we (Stephanie & Lauren) want to honor all of the brave men and women who have battled breast cancer in their lives. Therefore, the prompt is to make a ♥PINK♥ holiday card. It doesn't have to be all pink, but there must be some clearly visible pink on the card. For each newly made holiday card that you link up, we'll donate $4 to the Susan G. Komen Foundation. Last year we had 64 cards linked-up ... and donated $256! We'd really like to top that this year, but we need ♥YOUR♥ help to do it! The rules are simple ... you can choose any shape, size, style, theme, sentiment, papers, embellishments and additional colors you want ... you may combine with other challenges, use sketches from anywhere you'd like, and enter as many times as you wish ... but you must make a NEW holiday card each time, and there must be ♥PINK♥ on it somewhere! Stephanie says, "I decided to go all-in Pink this week. 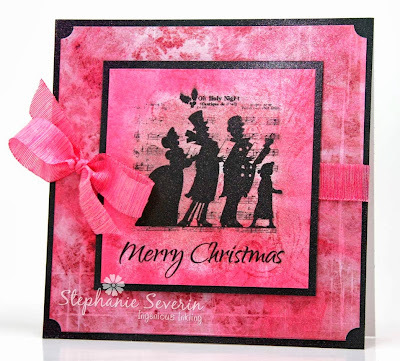 I stamped an the Carolers (can I just say ... so glad I wasn't born when women wore bustles) & sentiment from a new set called Christmas Happiness on designer paper and then added three shades of Pink Distress Ink. I finished with my favorite pink ribbon and a spray of Pink Iridescent Spray & Sparkle Glitter Varnish." Lauren says, "I went (almost) all pink, too... SURPRISE, lol! I had originally planned a few more layers, but having come across this beautiful pre-cut piece of Fancy Pants xmas paper, with the holly leaves and text already on it, i couldn't bring myself to cover up too much. 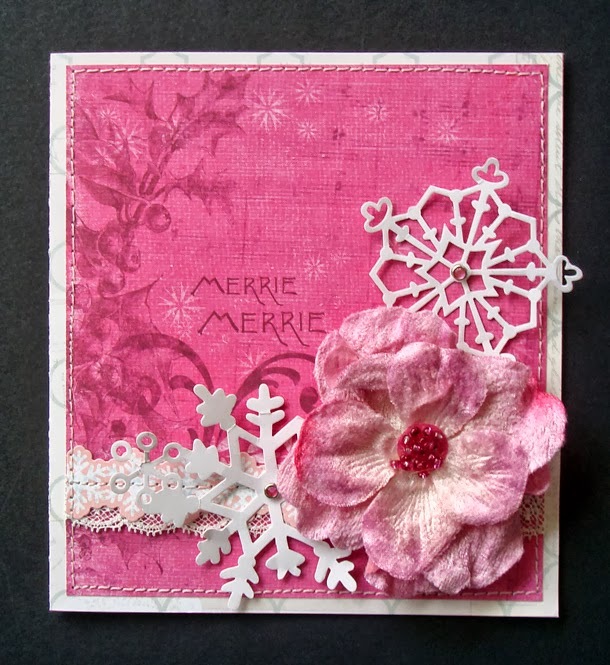 I just added the gorgeous Prima floral, a few snowflakes, and a little border and called it a day!" And now it's time for you to decide if ♥YOU♥ are ready to go all pink... or just a little pink... or maybe you'll help us boost our total donation by making a few different ♥PINK CHRISTMAS♥ cards for the cure?! Link them up here by 6pm (EST) on Wednesday, October 23rd. Keyword for galleries and our Flickr group is JB:13:21. There *may* also be a little random prize for one lucky cardmaker, as well... you never can tell, so link early and link often! :) THANK YOU for thinking PINK with us! ...combined a bunch of current challenges to produce this show-stopping round card with stunning ornaments made from an upcycled beverage can! 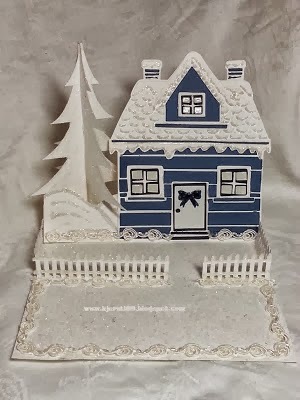 ...blew us away with this amazing 3-D house, set in its own perfect snowy landscape. Can we get a "WOW"?! Many thanks to *EVERYONE* who played along, as always, we cannot get enough of your creativity and cleverness! Drop back around at midnight, when we'll have a brand new prompt that we hope will find you in the PINK! We're loving your creative shaped card designs! Here's what we made for our second round of designs. Lauren says, "While I was deliberating over a few different ideas for this card, I saw that Mojo Monday was having one of their awesome "round or square" weeks, so I bowed in the face of such serendipity and used their awesome sketch. I did have to flip it, horizontally, when it turned out that my Crate Paper ornaments didn't quiiiiiiiiiiite fit above the elongated "Ch" of the My Mind's Eye chipboard word, but I think the resultant switch works pretty well." 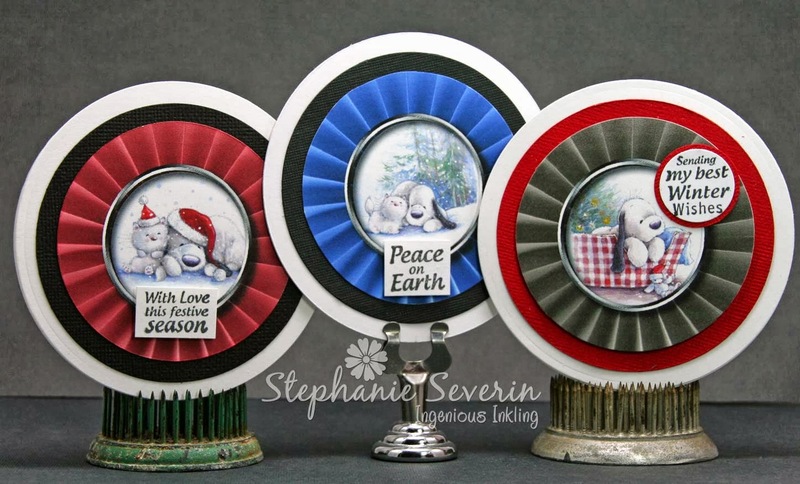 Stephanie says, "I gave my circle die cuts a workout this week. 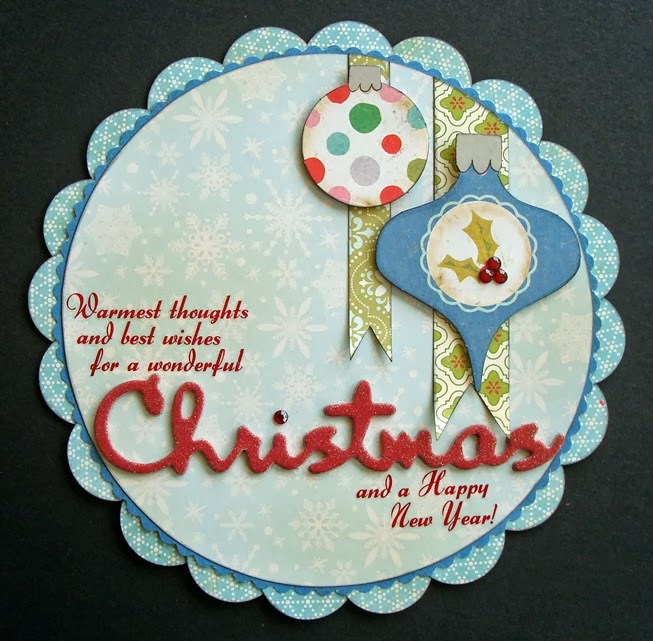 The cute little medallions are from the Barkley Christmas Papercrafting CD-ROM. 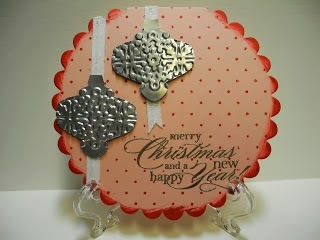 I then used the next two larger die cuts for my mat and card base. I finished with perfectly sized tiny sentiments from the Jingle Bells Sentimentals set. 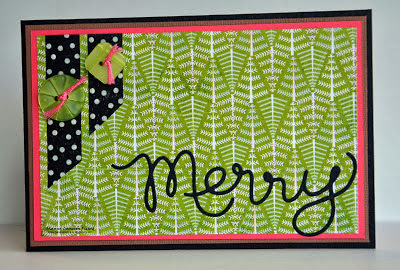 The finished card are about 4", so they will be perfect to attach to wrapped gifts or tuck into gift bags. You can click through to my blog to see close-up pictures of each one." 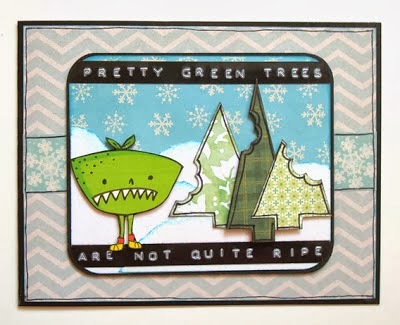 Remember, you have until 6pm EST on Wednesday October 9th to link-up your shaped card designs.